The Lynn Regional Wastewater Treatment Plant was selected by the Water Environment Federation for the George W. Burke safety award. This award was established in 1982 in honor of George W. Burke, Jr. for his numerous years of work in the water environment field. Receipt of the award encourages installation and maintenance of active and effective safety programs in municipal and industrial wastewater facilities. The Lynn Regional Wastewater Treatment Facility (WWTF) continually seeks to excel in water pollution control. Over the years this facility has experienced many significant capital improvements and operational strategies that have proven to be successful. Similar to the Lynn Water Treatment Plant, one method the WWTF utilizes towards gauging its success is in applying for awards amongst its peers. Throughout the years the WWTF has also been fortunate to be recognized with individual achievements associated with its safety, laboratory performance, maintenance and its plant housekeeping efforts. The Lynn facility earned the Massachusetts Water Pollution Control Association 2009 and 2011 Best Performing Large Waste Water Plant with a design flow more than 10 million gallons per day. This is a performance based award. The plant’s operational criteria for 2008 and 2010 was evaluated against other large Wastewater Treatment Plants throughout Massachusetts. Awarded the 2011 Massachusetts Energy Improvement Award for Energy Improvements made during the past 10 years. Through many energy incentives the Lynn Facility has reduced its electrical cost in excess of 3 million dollars. The facility is also in the process of installing a 600KY Wind Turbine with anticipated construction to be completed in September of 2012. Passed all EPA and DEP announced, and unannounced, inspections and audits during the past 10 years. These inspections are conducted on a regular basis several times a year, separately, by both agencies. Successfully Passed An OSHA Audit / Inspection in 2010. The Commission is operated by the Executive Director and is governed by a five member board; two City Council appointed positions, two Mayoral appointed positions, and one elected member of the City Council. The four appointed board members serve a three year term and convene once per month at the LWSC Headquarters. The Lynn Water & Sewer Commission is pleased to post these Annual Reports on the quality of Lynn’s drinking water. The most current contains results of your drinking water tested during 2017 and other important information about your drinking water. The Commission has an extensive water testing and monitoring program which is explained in this report. Test results show that Lynn’s drinking water is in full compliance with all the standards established by the Federal and State agencies that regulate public water supplies. The Commission is pleased to report that it has received the Massachusetts Department of Environmental Protection Drinking Water Award for Outstanding Performance for 2017. Lynn’s water system was initially established in 1870 when Breeds Pond was purchased as the first source of water supply. Birch Pond was added during 1873 when Beaver Brook was dammed to help supply water to Lynn. Walden Pond was created during 1889 by constructing a dam across Penny Brook and combining it with Glen Lewis Pond. The dam was raised during 1905 when the east-end dam was built. Construction of Hawkes Pond Dam was completed during 1895 creating Hawkes Pond reservoir. The Saugus River diversion conduit was completed during 1898, connecting the Saugus River to Hawkes Pond. 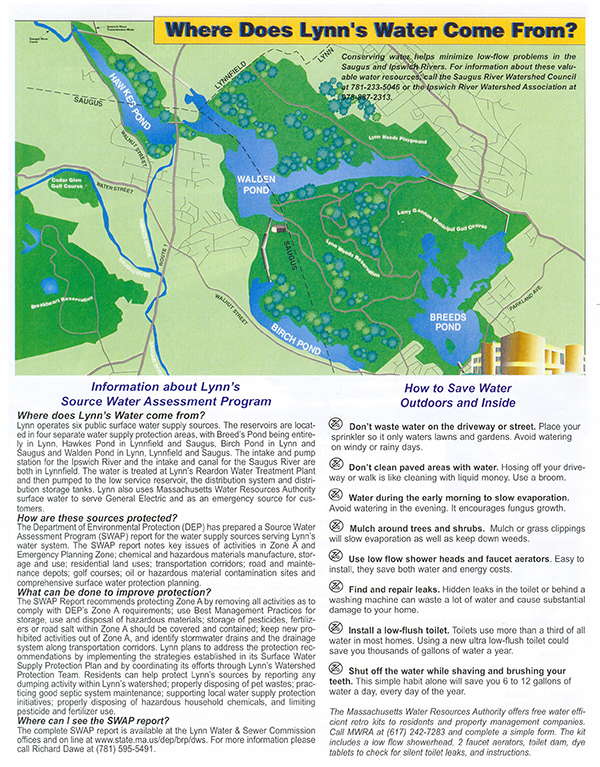 During 1918, the connection between the Ipswich River and Lynn’s reservoir system was established completing the existing water supply system. Wastewater collection began in Lynn in 1866 with the construction of a stone and brick sewer in Union street. By 1879, the Lynn City Engineer reported that all but 7.5 miles of major streets had been sewered. In the 1880's and early 1890's, many of the larger sewer mains were constructed including the Eastern and Western Interceptors along with several of the submains. During that decade, the number of connections rose from 1,005 to 1,988. The system has continued to expand and there are 140 miles of pipe. The Eastern interceptor is approximately 1,000 feet long and ranges in size from 40 inches by 54 inches to 64 inches by 72 inches. It is an egg shaped brick sewer constructed in 1885-1887. The Eastern Interceptor has not needed major renovation. A section of the interceptor was built in 1979 when the primary treatment plant was being built. The Western interceptor is approximately 10,400 feet long and ranges in size from 36 inches in diameter to 54 inches by 72 inches. It is egg shaped in some sections and circular in others, and was constructed in 1890-1891. 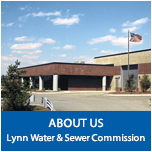 The Lynn Water and Sewer Commission is in charge of Lynn’s water supply system. It collects, purifies, and delivers water for use, then takes it back, treats it, and pumps it to the ocean. Since January 1989, Lynn’s drinking water has been treated in a new state-of-the-art, direct filtration facility located at 390 Parkland Avenue. This facility ensures that water delivery demands can be met now and in the future and that Lynn water meets all federal and state regulations. Lynn is blessed with an extensive independent water supply, including watershed lands stretching as far as the Ipswich River. The local water supply in Lynn consists of a series of interconnected reservoirs Hawkes Pond, Walden Pond, Birch Pond, and Breeds Pond supplied primarily by withdrawals from the Saugus and Ipswich rivers. Click here to see a graphic of where Lynn's drinking water comes from. The Distribution System contains the Lynn Woods 2.8 MG concrete storage tank, the Pine Hill 3.3 MG concrete storage tank, a major water booster pumping station that pumps to the Quinn Road 0.5 MG elevated steel storage tank, four (4) small residential booster stations, the covered Low Service Reservoir, and more than 80 miles of water main greater than 8 inches in diameter. The Low Service Reservoir is a 20 Million gallon covered and lined storage reservoir for treated water. The Reservoir effluent is chlorinated at two (2) effluent stations. The 65 million dollar primary treatment plant went on-line in 1985. The 53.8 million dollar secondary treatment went on line September 1990. These documents are also available throughout the website with each appropriate section or Department. 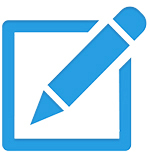 Please check back soon, this page is under construction.